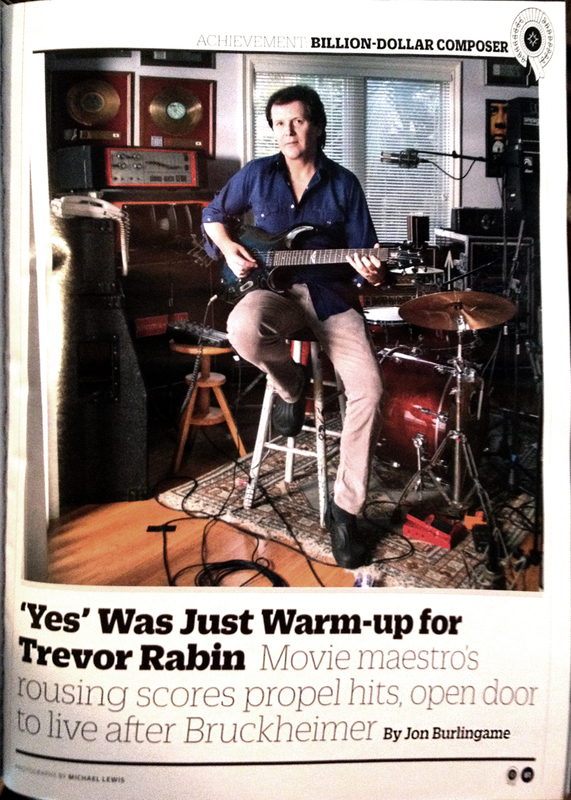 Trevor Rabin has one of the most interesting backstories of any currently working Hollywood composer. The South African-born ex-guitarist for Yes has done no fewer than 13 Jerry Bruckheimer movies (from Armageddon to National Treasure), is the town’s go-to guy for sports-movie anthems (Remember the Titans), and is now working on two cable TV shows (including Sharon Stone’s upcoming series Agent X). Variety asked me to profile him in three stories: a main story outlining his background and current work; what collaborators are saying about him; and a look at his latest feature, the military-dog movie Max. This entry was posted in Composers, Film Music, Interviews, Television Music and tagged Agent X, Armageddon, Jerry Bruckheimer, Max, National Treasure, Remember the Titans, Trevor Rabin, Variety on June 26, 2015 by Jon Burlingame. 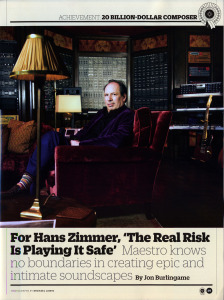 Hans Zimmer: $20 Billion Composer! Variety started a series several years ago — most of which I’ve written — called “Billion Dollar Composer,” a way of acknowledging how successful some of today’s top film scorers have been. 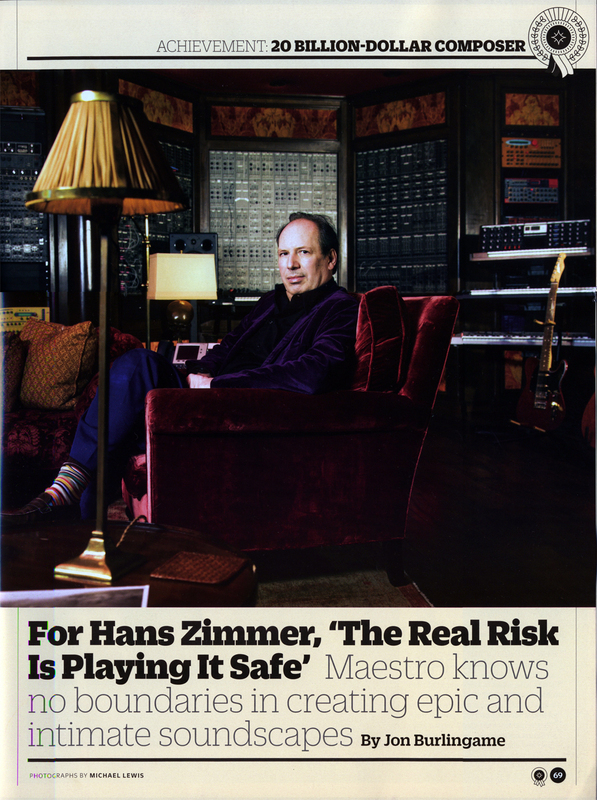 For our Hans Zimmer section, out today, the editors were so bowled over by the numbers they retitled it “20 Billion Dollar Composer.” Can’t say as I blame them. The section consists of a main story, that looks at his recent work and includes interviews with Hans and such filmmaking luminaries as Jerry Bruckheimer and Christopher Nolan, as well as former proteges Harry Gregson-Williams and John Powell; his newly revealed plans to return to live performing; his own thoughts (accompanied by colorful images) on six classic scores; and a look at his Remote Control studios, home not only to Zimmer but to more than a dozen composing colleagues. This entry was posted in Composers, Film Music, Interviews and tagged Billion Dollar Composer, Christopher Nolan, Hans Zimmer, Harry Gregson-Williams, Jerry Bruckheimer, John Powell, Mark Webb, Remote Control, Variety on May 7, 2014 by Jon Burlingame. In the summer of 2010, Harry Gregson-Williams had two new films coming out: Prince of Persia, which was a better score than a movie, and Shrek Forever After, the last of the big-screen Shrek films (and Harry’s sixth Shrek project for DreamWorks). It was a great excuse to revisit his entire career for the Los Angeles Times, including new interviews with several producer and director collaborators including Jerry Bruckheimer, Mike Newell, Jeffrey Katzenberg and Tony Scott. This entry was posted in Composers, Film Music, From the Files and tagged Harry Gregson-Williams, Jeffrey Katzenberg, Jerry Bruckheimer, Los Angeles Times, Mike Newell, Prince of Persia, Shrek, Shrek Forever After, Tony Scott on May 29, 2010 by Jon Burlingame.